Please book directly with the following properties. Cancellations clauses will be discussed with you upon booking. Please find attached booking link for your guests, please follow the below instructions. Please type in the destination field Pullman Adelaide in order to get your discounted rates. Then select your dates and press search. Alternatively please call or email hb217@accor.com for a bookingand and mention the AHRC 2019 Conference. 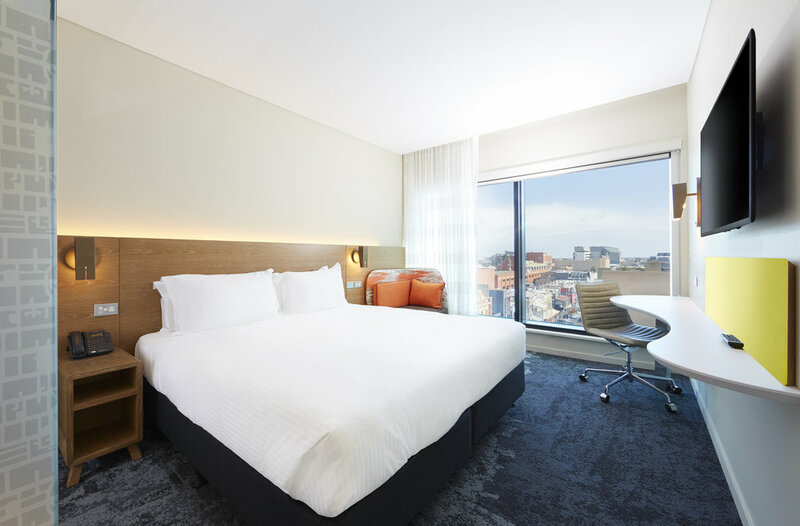 The new Holiday Inn Express Adelaide City Centre is situated in the vibrant north-west quarter of Adelaide's central business district. The great location provides easy accessibility to Adelaide Oval, Adelaide Convention Centre, the new Royal Adelaide Hospital, the SA Health and Medical Research Institute, University of South Australia, Adelaide Casino, and Rundle Mall shopping. The hotel features 245 well-designed rooms, equipped with everything you need for a great stay. Start the day right with our free Express Start Breakfast or Grab & Go option, stay connected with free Wi-Fi, after a long day recharge with our high quality bedding and have a restful night's sleep with a choice of soft and firm pillows. Experience an invigorating shower with our high quality bathroom and have everything in control with our self-service laundry facility, business centre and fitness room.